On the maternal side, “Rikiharuʼs” dam was one of the “original three” – WKS girls. The selection for the first three heifers to accompany both “Michifuku (IMP JAP)” and “Haruki 2 (IMP JAP)” were made to compliment each other, therefore no surprise that these animals were the best. Her dam, “Rikitani (IMP JAP)”, is not as well known as Suzutani (IMP JAP) or Okutani (IMP JAP), however her genetic potential is equal, if not better than her stablemates. She shares a very similar pedigree to Suzutani (IMP JAP) being a Tanishige (JAP) out of a Shigeshigenami (JAP) daughter. “Rikitani (IMP JAP)” was never a very prolific producer of embryos, therefore progeny from this cow family are very few and far between. 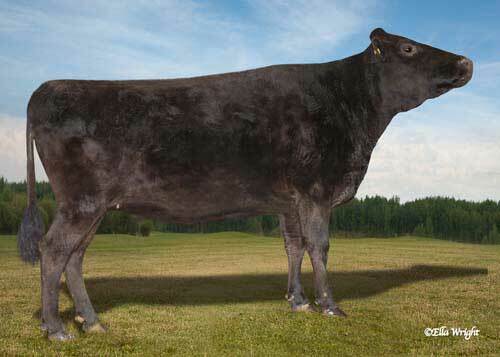 The genetics from this cow family have been performing extremely well in our program. “Rikiharuʼs” full siblings include FB14909 – Kanadagene 101 (CAN) and 3/4 siblings include Australian sires – Overflow Katsumi, Longford Tojo, Longford Zaki, and Longford Honjo. All four sires with tremendous proofs on Breedplan.